There once was a family farm out between Kevil and Gage where memories were sown and work ethics cultivated. Oakley and Bill Bondurant raised their sons on that piece of land and in turn their sons raised families on the farm. The Bondurant family was not afraid of hard work the likes of which most people these days have never experienced. They had a dairy operation and since dairy cows never take a day off neither do dairy farmers. They raised both burley and dark fired tobacco. Then there was the 15-acre strawberry patch to tend; and row crops to plant and cultivate and harvest; and chickens and turkeys and goats to see after. It’s exhausting to think of all the work the operation entailed. It would seem entirely reasonable and logical for anyone who grew up working this labor intensive agrarian operation to want to move as far away as fast as possible and never look back but that was not the case with Diane Shrewsberry. “I wanted to keep the family farm alive,” said Diane. Diane chose a unique method of perpetuating the farm. Before the farm acreage was sold, Diane and her family cut a dead walnut tree that had grown on the edge of the yard ever since her grandmother, Oakley, planted it years before. The lumber was milled, stickered, stored for several years, then hauled to a kiln to dry. After these steps, it was ready to be taken to an Amish cabinetmaker in Marion, KY where it was transformed into handsome, one-of-a-kind cabinetry. 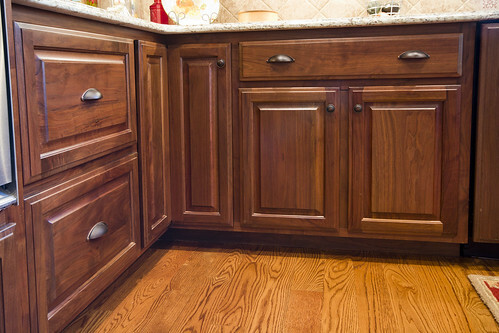 The attractive walnut cabinets were installed in the new home Diane and her husband, Steve, built on Lutes Road. The cabinetwork anchors the kitchen and spacious living area like the old walnut tree anchored the east end of the yard of the Bondurant home place. From her back porch, the walnut tree was within view as Oakley Bondurant and whatever kin was enlisted to help, hulled butter beans and snapped green beans in preparation for feeding family and hired hands. Not a lavish cook and leaning towards utilitarian, stick-to-your-ribs, home cooking; Oakley never worked in the fields but could always be counted on to serve a pot of beans that had been simmering all morning long with a pone of cornbread. The rich, chocolaty brown cabinets emanate warmth much like the memories Diane recalls from growing up on the farm. She reminiscences about sitting on the front porch with her grandfather, Bill, watching the sunset light up a big western Kentucky sky while her grandmother fixed a bite of supper. Rubbing your hands across the smooth, hand-rubbed finish of the exquisite woodwork, you can almost feel the vibration of the crickets chirping and the lonely call of a whip-poor-will on a humid summer evening. Bringing a piece of the farm into the new home also keeps memories alive of taking trips to the train station to await the yearly arrival of a hobo, named Shorty. “We never knew exactly when Shorty would come into the train station at Kevil but for years we made the trip into town everyday for about a week until he showed up ready to work around the farm another season,” reminisced Diane. The trek was made until Shorty would climb out from under the train with his bindle. Shorty didn’t mind traveling to his destination via the underbelly of a train but was petrified of storms. A good handyman, Shorty holds a special place in Diane’s memory as she fondly recalls him calling her mother, Annie Girl, and taking Diane fishing as a young girl. Diane often worked alongside the men. At five years old, she navigated a truck for crews of hay haulers. She still feels tinges of anxiety when recalling driving grain trucks to Bungee in Cairo. She laughingly recants catching a wing of a big batwing disc on a fence and popping fence posts out of the ground as her family frantically, and to no avail, tried to get her attention to stop her. Encapsulated in the straight grain of the walnut wood are also cherished memories of Sunday dinners on a flat bed wagon under the oak trees and playing with cousins in the creek as the grown ups whiled the afternoon away talking until time to milk the cows. The Bondurant family farm and generations gone but not forgotten will live on in memories warm and rich like the exceptionally strong, durable, and beautiful walnut wood crafted into Diane Shrewsberry’s cabinets.